A bronze sculpture of three figures on display outside the Royal West of England Academy (RWA) in Bristol has been smashed apart by vandals. The artwork, made by British sculptor David Backhouse, had been on display for about a month. 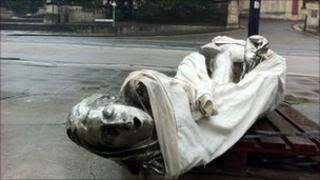 RWA director Trystan Hawkins said the sculpture was beyond repair but outdoor exhibitions would continue. He said more security would be brought in before Damien Hirst's Charity statue goes on display next week. The three figures had been created one on top of the other. Now, only one of the figures remains in place with the other two strewn on the pavement. Mr Hawkins described the incident as "completely mindless vandalism". He said: "It's such a shame because we've had such a fantastic response to the sculpture. "Originally we planned to have them there until the end of May, but we've had so many comments we extended the exhibition until the end of August. "We're reviewing what we're going to do, but it seems fairly impractical that we can repair the works. They are actually beyond repair. It's such a shame." Mr Hawkins said the area at the bottom of Whiteladies Road was a "prime site" for exhibits with two million people passing by every year. "Clearly we will need to have CCTV," he said. "We will be showing other works, but obviously we're going to have to rethink the kinds of works that we show there. "Next week we've got an 8m high bronze sculpture from Damien Hirst going in. That is quite substantial." The damage was reported to police by a passer-by at about 0930 BST on Sunday.